The Goldman family tradition of excellence spans a period of more than sixty years. Today, Goldman provides high quality fine jewelry – wedding rings, bridal sets, anniversary rings, solitaire enhancers all in 14K and 18K gold, titanium, tungsten, and platinum group metals. This year, in addition to an offering of classic plain, engraved, and diamond bands, new engagement rings will be introduced in the Platinum group of metals as well as new wedding bands in Platinum and Palladium. This platinum wedding band is a timeless classic. Its sandblasted look will definitely add charm to any finger. Perfect as part of a matching set of his and her wedding bands. 8.50 mm. Frederick Goldman founded his company in the late 1940s as a one-man operation specializing in plain wedding rings. The success of Frederick Goldman, Inc. is the result of years of uncompromising dedication to a never-ending quest for excellence. The use of precious metals, precious stones, special finishes, and manufacturing techniques has made Goldman masters in the art of jewelry making. Innovation and sophisticated marketing programs, developed and offered across the many divisions, have made the company a leader in the industry. As a result, Frederick Goldman is the manufacturer of choice for thousands of retailers across the country. Gelin Abaci is a company that grew out of a concept held by Gabriel Gelin and Sam Abaci. Together they have a combined total of more than 50 years in the jewelry industry. Since its inception, Gelin Abaci has made a name in the industry as the premier designer of Tension Jewelry in the United States. In keeping with the ever-changing desires of consumers, they continue to add more unique styles to their popular Tension Collection and AmorÃ© Wedding Band Collection. Tension Set Ring Mounting (Width: 6.5 mm) for 0.25 to 2.0 carats Center Diamond in ring size 3 to 9. 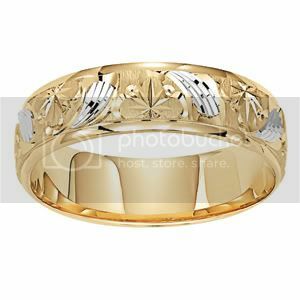 Ring could be ordered in 14k yellow or white Gold and 18K yellow or white gold Gold. Each Tension Ring is made especially to your specifications. Depending on the style, there is 65 to 95 lbs. of pressure applied to the girdle of the center stone. The Tension Setting allows the maximum amount of light to pass through the center stone, creating brilliance that is superior to all traditional settings (prong, bezel, channel, etc.). Tension products are available in platinum, platinum/18k combination, 18k gold, and 14k gold. Tension Set Ring Mounting (Width: 5 mm) with 0.15 carats round diamonds in ring size 3 to 9. Ring is available in 14k yellow or white Gold, 18K yellow or white Gold, and platinum. Gelin Abaci takes great pride in offering designer wedding bands of the finest quality. Each Gelin Abaci wedding band is crafted in 14k, 18k, platinum, or combinations thereof to show the intricate detail of each design. The AmorÃ© Collection wedding bands have a lifetime warranty against any imperfection in design or workmanship. The Gelin Abaci signature inside our rings is your guarantee of quality and value. Each ring is hand inspected before leaving our facility. To ensure the highest quality, each design from Gelin Abaci goes through a rigorous inspection process. Each stone is carefully inspected when it arrives at our facility. This includes checking for any surface or internal imperfections. Tension setting places the center stone under pressure to provide optimum strength, elegance, and security. Gelin Abaci assures the design and craftsmanship of our Tension settings, which are engineered to accommodate your center stone. Once your jewelry is complete, the Tension jewelry is re-inspected by our quality control staff. New York based designer, jeff Cooper, was voted Designer of the Year by the Platinum Guild International. "Platinum makes it perfect," says Jeff and this point of view is evident in his timeless and timely designs for the bride and groom of today. Jeff Cooper began his journey in the jewelry industry as a young man in Manhattan's Bowery district, working with his hands at the jeweler's bench. He eventually broadened his horizons to sales and began working for several companies; he honed his skills and then founded his own company in 1976. Jeff worked endless hours, designing and creating his line of fine jewelry, as well as developing his relationships with fine retailers nationwide. Working in Platinum, Gold, and Diamonds, Jeff always had his fingers on the pulse of the developing styles and trends in bridal jewelry. Jeff's designs are clean, elegant, and simple, and he believes it's the classics that never go in and out of style, and that less is more. In technical terms, to create simple and clean jewelry is more difficult then engraved work, because there is nowhere to hide. You can't cover up poor quality metal and poor setting work. While the rest of the industry rides the waves of each trend, Jeff prefers to be consistent in his look and design philosophy and create rings that are indicative of his brand image. 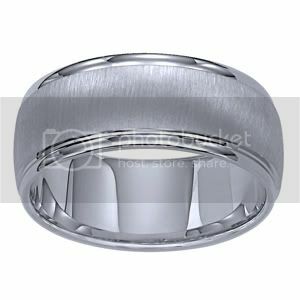 Wedding ring is curved to match semi-mounting style. In 2000, David Cooper, Jeff's eldest son joined the company full time. Bringing with him a wealth of gemological experience and creativity, the two are an award winning team. Jeff and David believe in quality and service – each ring is important to them for so many reasons. They view their jewelry as far more than a material possession, it's symbolic of the union and relationship between two people, and it's the foundation on which two people can build their future. Jeff's inspiration comes from his daily life, his love for his family, his passion for style and fashion, as well as the excitement that can be created with the right ring for the right person. Every ring tells a story, every ring is individual, and every client is important. David's design work has steadily been adding to the new creations. David says, "A ring is a three dimensional piece of wearable art, and I like to combine elements that illustrate a picture or emotion with each ring." The essence of Mark Silverstein Imagines is creativity. A 28-year veteran of the jewelry business, Mark Silverstein brings to life distinctive jewelry designs that capture the evanescent nature of beauty. Introduced in 2005, Mark Silverstein Imagines features engagement rings, wedding rings, and other fine jewelry highlighted by the Gossamer, Heritage, Lisse Pave, and MSI Originals collections. This ring mounting features figure-eights across the finger in a delightful mix of colors and metals. The 18k white gold band is designed with a stream of 18k rose gold that is set with a collection of thirty-six fancy light pink round full cut diamonds. Curving around the pink diamonds are two strips of white round full cut diamonds. From Mark Silverstein's Gossamer Collection. The center gemstone is a Cubic Zirconia; it is NOT a diamond. Introduced in 2005, Mark Silverstein Imagines features engagement rings, wedding rings, and other fine jewelry. These collections focus on Mark's commitment to quality. All of his designs meet his exacting standards and discriminating specifications. "All diamonds are perfect…in-between the flaws," says Mark, who believes that looking into a diamond is like looking into a person's soul and discovering their beauty, not their flaws. This 18k white gold contemporary aquamarine engagement ring wraps the finger in radiance. Ninety-two round full cut diamonds connect two hearts with a greenish blue aquamarine prong set in the middle. Mark believes in every facet of the Gossamer story, which says that all people are connected by one of the most delicate things on earth, the Gossamer thread. As the architect of the engraved platinum look, now an industry staple, Mark's marketing talents, along with his unique design foresight, differentiate him as a visionary and a hands-on leader. His mission is to make people smile by developing his ideas into products and services that dazzle even the most discriminating consumer. An elegant 18k white gold mounting showcases a natural Pink Tourmaline in this Mark Silverstein Imagines engagement ring. The 0.75 carat, faceted mixed cut gemstone has a purplish red hue. This beautiful tourmaline needs little adornment; the only additional accents are two round full cut diamonds which nestle on the sides of the mounting. With many new styles to choose from, each with its own unique signature, we think you'll find our creations as beautiful and rewarding as we do. We use only the finest quality materials available, and put them in the hands of the most talented artisans on the planet. They bend, mold, set, polish, and engrave to transform the products of our imaginations into unique creations, for you. So if you see something you like and you just must have… treat yourself. Our only hope is that you will enjoy wearing it as much as we have enjoyed creating it. It's a gift that truly keeps on giving. From us to you. Jewelry Vortex is the number oneonline store due to our quality, pricing, and our 30 day no questions asked return policy. Bringing the newest in Designer Bands, our collection offers the greatest variety of unique rings in a range of finishes and metal combinations. Take a look at the colorful combinations of white, yellow, and rose gold along with solid, textured, and polished finishes. 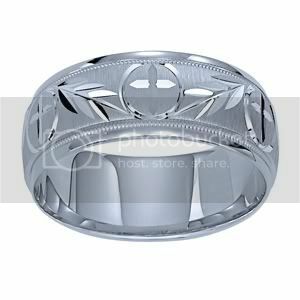 At Jewelry Vortex.com you can choose from one of the largest inventories of factory-direct jewelry at unbeatable prices. We believe that jewelry is an investment so we pride ourselves on delivering you a quality piece of jewelry. We have built a reputation for our product range and customer service. When choosing to purchase your jewelry from our online store, feel confident that the images on our site will give you a clear understanding of what you're buying. Our quality images are one of contributing factors to our online success. What you see is what you get – no unexpected surprises. 14k Solid White & Yellow Gold. This two tone wedding band has a ring of rose gold attached by a ring of yellow gold finished off with a set of white gold rings. Quality, precision, and fashionable are words that are synonymous with Dora. The perfect blend of exquisite craftsmanship, style, and design, Dora rings and wedding bands are the ideal choice when choosing a ring that is both elegant and refined. Getting ready for a wedding can be traumatic, but it should also be joyful. 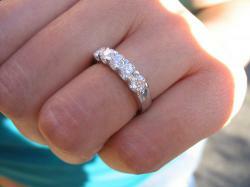 Selecting the jewelry you'll wear with that beautiful wedding gown can be a daunting task. The current big and bold trend in designer jewelry has also trickled down to bridal jewelry. Light cotton and organza gowns are the best picks for spring, and the 50s inspired trends from winter will linger through 2008. This year calls for classic silhouettes and romantic embellishments including lace, organza, eyelets, and tiny beads. Very full skirts are still strong this year, and a contemporary look involves a simple straight-cut gown with an extra-long train. Low-cut wedding gowns are very popular, and a long necklace would add just the right touch. Necklaces utilize the bigger-is-better theme as well, dripping gemstones and setting off demure necklines. Dramatic cascading pendants show off two, three, or more linked-stones. Sterling Silver braided chain necklace with hand knotted oval MacramÃ© pendant and Crocheted choker with Freshwater Pearls and Austrian Crystals. The necklace has a secure clasp with an adjustable length chain. Rhiannon was the Welsh Goddess of art, communication, creativity, fertility, ghosts, leadership, manifestation, movement, poetry, rest and writing. Hand-knotted Sterling Silver MacramÃ© choker with Freshwater white pearls, 1 1/4" wide. The necklace has a secure clasp with an adjustable length chain. Maia was the Roman Goddess of playfulness, sexuality, and wishes. Thick cuffs of silver and gold sprinkled with gemstones are currently in fashion. Tiny rhinestones or beads can add an air of daintiness to chunky designs. Some brides are walking down the aisle with family heirlooms on their wrists for an old-fashioned sentimental air. Complete your antique-inspired set with a pearl and cubic zirconia bracelet of stunning character. A repetition of silver intertwined hearts form a charming display. A darling wedding gift, this Double Heart Linked Sterling Silver is so sweet the soon-to-be bride will adore it. Although they might not be as important as your other jewelry, earrings really do complete a look. Try on various earrings and see which look best with your gown's neckline and the hairstyle you plan to wear on wedding day. You want to make sure that your earrings show up. The look in wedding jewelry now is bold, and the hottest trend in the spotlight is the chandelier earring. The dangling pieces of jewelry boast diamonds, pearls, or even glass beads, evoking a glamorous, Art-Deco look. Hand-knotted Sterling Silver chandelier earrings with Sapphire color Czech & Austrian crystals, 2" long. Castalia was the Greek Goddess of art, children, creativity, inspiration, and joy. Pearl drops are elegant wedding selections. The white of pearls can illuminate your face. You can also go for something more dramatic, such as hanging crystal earrings, but make sure they don't overwhelm your dress. If your gown is heavily beaded and sparkly, you may want to wear subtle or smallish earrings. Three ethereal iridescent freshwater pearls are tiered to dangle from three slender sterling silver chains attached to earring posts adorned with a shiny silver bead. Called the "Angel" collection, Yarwood-White has a created a number of new bridal jewelry pieces to add to their already fairly large selection. Inspiration for "Angel," came from vintage jewelry designs, but some of the materials used to craft these designs are from today's popular crystal made by Swarovski. Also included are Freshwater pearls and diamonte crystal spheres. These pins have a subtle, vintage-style glint rather than a dazzling bling-effect. The delicate and ethereal Angel range features Swarovski crystal drops, diamantÃ© spheres and a dusting of freshwater pearls. For their big day, most brides have a picture in their minds of what it will be like. Their style of wedding often matches their personality, from romantic and classical to trendy and fun. With your peaches and cream complexion and soft, loose hair you will look fresh and natural on your wedding day. Your dress is floaty and unstructured, and you are planning a fun, relaxed wedding day with lots of feminine touches. Organic or floral designs in pearls or clear crystals finish this look beautifully. Decorate your hair with Fresh Flowers and scatter pearl or crystal pins in between. Choose drop earrings with movement or a garland-style necklace and consider introducing colour to add interest. Flower hair pins, feather combs, delicate drop earrings, coloured crystal necklaces and bracelets. Here are a few more pieces of jewelry from the various collections that I cruised around on. To see if renting jewelry was cost-effective as well as useful, we checked out four national online companies. We loved the ability to augment our meager jewelry collection with many stunning pieces. But in some cases, the services were expensive and required longer-term commitments than we wanted to make. Within hours, we received an email from the founder, who wanted to reassure us that despite a holiday falling midweek, we could still expect a Friday delivery for our Saturday event. As promised, the earrings arrived that day, and returning them two days later proved just as easy, since an addressed, prestamped envelope was provided. We just wished we could have kept them for a little longer. 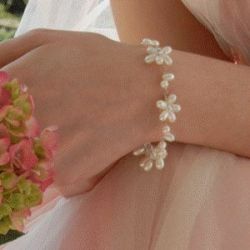 Borrowedbling.com lends out primarily costume jewelry. Customers sign up for one of three membership plans. There's no extra charge for each individual piece. For $29.95 a month, a deal cheekily called the Countess, we could borrow as many as two items at a time, while serious jewelry addicts can sign up to be a Movie Star for $99.95 a month and lease as many as three items. The higher-priced memberships also provides access to a wider selection of items. Joining was simple enough, though we weren't thrilled that we had to disclose our birth date and the last four digits of our Social Security number. Once we filled out all that with an assist from the helpful Service Desk, we were able to start borrowing immediately and settled on a pair of amethyst studs and a sparkly pink cocktail ring. We had wanted different pieces but were told we had to upgrade to Duchess ($49.95). Three days later, the promised items arrived with a handy return envelope. While the service was a breeze to use, we were annoyed that we couldn't cancel our membership until three months later. This diamond and 18kt white gold necklace is from Adorn Brides. It retails for $9800 but it can be leased for a mere $360.